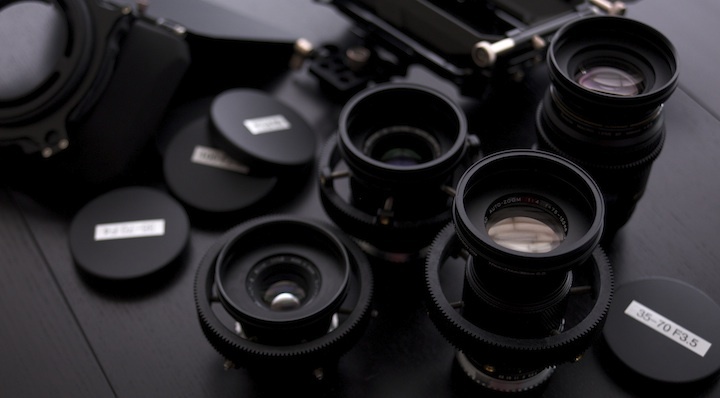 This guide is for people looking to modify their lenses to work well for video and film use. Before we get started here are some things your might want to know. So for $431 I have three killer little lenses for video. Which Lenses Are Best To Use For This Mod? The lenses I’m using in this video are great cheap lenses, but they’re hardly the best choice for cinema use. Mainly because the two zooms move in and out and their front filter ring moves. But you can’t beat the price. Primes are much easier and better to use in general so Zeiss, Leica R or other more affordable primes work great. As for zooms, the Nikon AF-S lenses like the 17-35 F2.8, the 28-70mm F2.8 and the 80-200mm F2.8 are all great for this mod. Can A Professional Do This For Me? You bet. I’d be terrified of altering the aperture on a $2000 lens so I’d send my lenses to Duclos to have those lens masters take care of my glass. Their Cine Mod costs $60-$250 which isn’t bad at all given the quality of parts and work they offer. Here is a step by step guide to converting your stills lenses to a cinema lens set. The first thing you obviously have to do is to get some lenses. In this video I used Olympus OM lenses and adapted them to Canon. But there are loads of other brands you could use. Check out my guide on manual lenses to find the right set for you. On that page you’ll be able to find the right adapter for your camera. You can do this yourself by searching Youtube for a tutorial on the lens you have or you can have it professionally done by the lens masters at Duclos for $60/lens. I’ll have some videos on declicking OM lenses soon. The next step is adding 0.8 pitch cinema lens gears to your lenses. There are several different brands you can use but my favorites are the Cinevate gears and the Half Inch Rails Fat Gear. When it comes to using cine gear (like matte boxes matte box filters) with photo gear (DSLR lenses, setup up rings etc) there is a problem. Cinema lenses and adapters have 3 standard filter thread sizes: 80mm, 95mm and 114mm. Where as photo lenses and setup ups have completely different sizes (77mm, 82mm etc). This causes some problems. For example, you can take a matte box and clamp in right onto a cinema lens and still use the lens filter thread. Super cool. But you can’t do that with a photo lens or even the Rokinon Cine primes. I can’t afford cinema glass, so I did some research and found Cordvision’s 80mm Cine rings. These rings will adapter your smaller 52-77mm lenses to a cinema friendly 80mm outer diameter lens ring. Now not only will your matte box attach direction to your lens, but you also still get to use the 77mm filter thread on the lens! Your other option is to get the 80mm Ring from Duclos. I know that was a lot of information, but trust me, its a big deal. Check out this video for more info on the 77-80mm rings. Final step is to add 80mm caps. You can get really 80mm push on cine caps from Duclos for $25 or you can get the cheap 80mm push on caps I mentioned in the video for $1. Genus 80mm Clamp on Adapter – This adapter allows you to clamp the matte box directly onto the lens for a perfect fit. My lenses all have an outer diameter of 80mm (thanks to the adapter we looked at earlier) so now I’m gold. Genus Matte Box Lite Kit – This is the Matte box I used in this video. Xume Adapters – Killer magnet filter holders. So there you have it, a couple tips for cine modding your stills lenses. Let me know what you guys think and share your own tips with us! can’t wait to dive in and start making some modifications. I picked up those three along with a 28mm in a kit off Craigslist and have been loving them. Why are you overtaping the Canon logo? Great DIY! The lenses looks really professional and Im sure switching out lenses will be a breeze since all the OD and lens gear are the same size. Can’t wait to see how to declick those lenses! What is the brand of Follow Focus you had displayed in the video? I was wondering if you could still attach those 77mm magnetic xume filters on the lens while the clip on mattebox is attached? I can’t say yes for every MB, but I just checked and you could use them if you didn’t clamp on the MB. So it’ll work with something like a PV Matte Box that is attached with rods and using the nuns knickers. Super helpful post! After being convinced to buy the Genus Matte Box Lite, I am now going to do the same with my lenses. Thanks Caleb. Very interesting article thanks a lot ! My problem is that all my filters are 82mm. What would you do in that situation ? Hi Caleb – why the Olympus lenses? Could you do the same with Nikon? Because I got them for dirty cheap :-) But yes, you could also do this with pretty much any manual lens. 82mm is tricky… But it can be done. You can get an 82mm to 77mm step-down ring that will allow you to use the 80mm cine ring. The only issue you might have is vignetting on a Full-Frame sensor. 82mm is tricky… But you can make it work. You can get an 82mm to 77mm step-down ring that will allow you to use the 80mm cine ring. The only issue you might have is vignetting on a Full-Frame sensor. Its the Genus Bravo MKIII. Video on that soon… In short it makes me more inconspicuous. Excellent post! Thanks for the really useful info compiled in one place. TY. EXPENSIVE, but it’s a killer! Keep up the great work. I read your site everyday. thanks Caleb, because of all my lens are 82mm, those are for match for the polar and ND filter. so I can’t change the lens to 80mm. Will you mind to help me try the 80 mm lens cap its fit on 82mm lens? Beacuse i am really interest of the lens cap. thanks so much. Thanks. This is good stuff. I have a bunch of old Nikon glass (switch to Canon) with Nikon-to-Canon adapters, they have or will have the Edelkrone follow focus rings on them. It’s good stuff. But the declicking and Cinerings are very useful to know about. Thanks. I’m interested in getting those Xume magnetic filter holders with the Kaiser 85mm slip on lens cap you mentioned below, but i’m worried about the strength of the magnets, i don’t want my filter to be pulled off with the Kaiser cap when i remove it…Any idea if this can happen or not ? I’m curious, why do you recommend sticking with the 77mm to 80mm cine ring and using an additional step up ring? If you have say a 62mm lens, wouldn’t it be easier to just get the 62mm to 80mm cine ring, rather than getting a 62mm to 77mm step up ring and a 77mm to 80mm cine ring? I am looking into converting my lenses but first have a quick question. I know you are a Canon shooter but when I change my manual aperture on a Nikon 35-80 4 lens my 3200 tells me to lock lens aperture to largest setting. Is there some setting I can bypass to allow me to shoot manual aperture? Cat’s out of the bag.. :) And I can definitely advise to those who are thinking about the mod to actually start with good tools when disassembling this old lenses. I’ve de-clicked a few lenses for myself and went on ‘helping’ some indie production house here in Holland. I don’t know how many Samyang and old Nikkor primes I’ve modded. But everyone’s happy to give em old lens its new life. Thanks for the great information! Clearly presented also. Question: I’m looking at building a set of manual primes. My options are Nikkor AIS or Olympus Zuiko. Would you recommend one over the other, or collect a mixture of the two? Great tutorial Caleb! I’m very curious about your experience with the Olympus OM lenses. I know you said you sold your Nikkor prime set and was wondering how they compare to the Olympus? Do you prefer one over the other? Notice difference in sharpness/image quality/ chromatic aberration? This is a great post I have a whole set myself and love them. I found this site http://www.lenshack.com that will also transform your vintage primes lenses into cine style lenses. Thanks for the great post but I thought the reason to pay the extra money for cine lenses was because they offer higher optical quality. (better glass) Please advise. Excellent. I purchased two 77-80 adapters today. I got the Cordvision ones. I’m not sure what the OD is for my 24-70mm f/2.8 Nikon lens but I think I’m OK. I’ll have to get out the ruler. I mainly got them for my 85 1.4 and 70-200 2.8 which have a similar OD but not enough smooth clamping surface due to the lens hood interface. They do offer better optics, but if you don’t have $4K+ to spend on each lens, manual lenses modded for cinema are great. And if you use Zeiss ZF.2 lenses you have the same glass in the CP.2 lenses, just without the rehousing. I really like the Olympus. They’re on par with Nikkor primes, but 50mm aside, they can get mighty expensive. AIS Nikkors are probably the most flexible and easy to find lenses. Check your manual. Every camera has a different name for the setting, but most cameras allow this. Yes and no… I think using step ups is best because you can use that filter ring later on a different lens no matter the filter size. But if you don’t mind it always being a 62mm to 77mm than there is nothing wrong with it. Great! Can’t wait to dive in and experiment on this… Thanks! any shoot result with these lenses ? Use to shoot with manual lenses on My Nikon D7000. The way the nikon cameras adjust your aperture is with a lever on the body. So when you adjust your aperture on the camera, it translates this to the lens. You need to lock it to the manual aperture (say f/22) to allow the body to control your aperture. Unfortunately this means you can’t manually control your aperture from the lens on Nikon bodies. I believe you can with the more expensive bodies i.e Nikon D4 but definitely not with the D3200, D5200 & D7100. Wow, contacted them. When will people figure out that using google images for whatever isn’t a good idea? Looks like they took the post down. i hope he realized his mistake. btw i still have the image in question if you need it. One question is are there any issues using Xume adapters with these 80mm Cine Rings? I hear ya. So sad that they aren’t making them now. I haven’t found any issues wit the Xume’s yet. Great video. So from what I see in the video, you’re attaching the 77mm Xume adapters at the end of the 80mm O.D ring?? Basically, I’d still be able to attach a 77mm variable ND/CPL on it and attach it to the mattebox with no issue of it spinning? (I have the GenusTech lite). I just wanna make sure I have that right before I go ahead and splurge! I know this is an old post, but does the small 50/1.8 with the focus gear work with your cage and follow focus? Trying to figure out if I can fit a follow focus on my upcoming rig. Mine worked, but it all depends on the follow focus and other gear. If I wanted to use this technique with a wider angle lens, what lens would you recommend? Something around the 15-24mm range? Thanks in advance. cameras, and the lens gear hits against it. distance a little bit, but could there be any issues with doing this? Thanks and keep up the good work, Nick. Thanks! Whats you’re next video going to be on? Hey Cableb, what is the diameter of these cinevate gears?